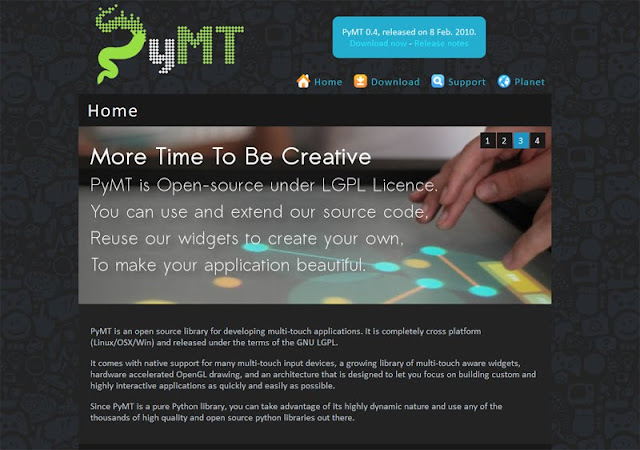 The open source library, for developing multi-touch applications, PyMT has just been released in version 0.4. Please take a look at the release notes to see what’s new in this release. Besides all the new stuff this release brings, the PyMT website has also been updated with a new slick look. If you know your way around Python and want to develop applications that utilize new user interfaces, such as multi-touch, you should check out PyMT. You may have seen examples of this technology in use on CNN, at a mall, or on the Microsoft Surface(R). Multitouch is here to stay - let's hope PyMT will push Linux and open source forward in this area.